A child-friendly, stable playpen with flat wooden bars in a modern decor. 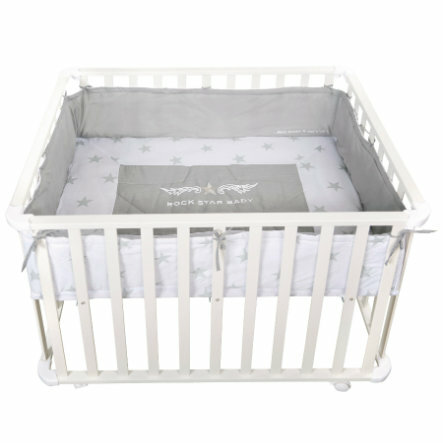 Built up, the square roba playpen offers a 75 x 100 cm play and cuddle area with a lovingly designed fabric inlay for all-round protection. The back-friendly 3-fold height adjustability makes it easy for parents to play with their babies. Rollers provide the necessary mobility for this playpen. If the playpen is no longer needed, it can be folded quickly and easily and stowed away to save space. A roba playpen as a beautiful, safe playground that guarantees long usability and where children love to discover the world.